A ½-cup serving of kohlrabi contains approximately 80 calories. Kohlrabi has a mild flavor similar to turnip, and is also called cabbage turnip. Raw kohlrabi is crisp and flavorful served in a vegetable tray with dips or added to salads; it can also be cooked in a variety of ways and added to stir-fried dishes or casseroles. 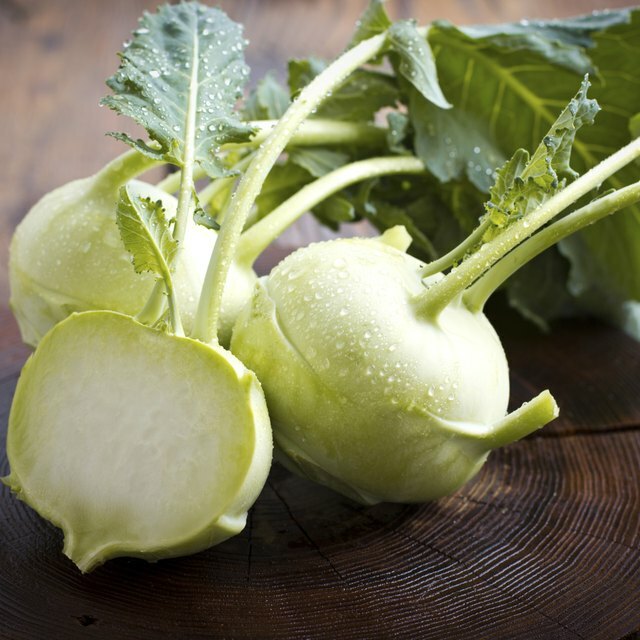 Kohlrabi is high in fiber, vitamin C and potassium, but low in sodium and calories. To prepare kohlrabi, wash it thoroughly, then use a paring knife to trim off the stems growing from the sides of the bulb. Kohlrabi smaller than a tennis ball is tender and requires no peeling, but larger kohlrabi has thicker skin and should be peeled. Slice or chop the kohlrabi. Throw the leaves and stems on your compost pile or cook them the way you would cook greens such as spinach or chard. To steam kohlrabi, cut the kohlrabi into small chunks or thin slices. Cover the bottom of a saucepan with about 1 inch of water, then bring the water to a boil. Place the kohlrabi in a steamer basket, then place the steamer basket over the simmering water. Lower the heat and steam until the kohlrabi is tender -- about five to seven minutes, depending on the size of the pieces. Eat steamed kohlrabi as is, or top the kohlrabi with chopped parsley, melted cheese or butter, then season it with salt and pepper. 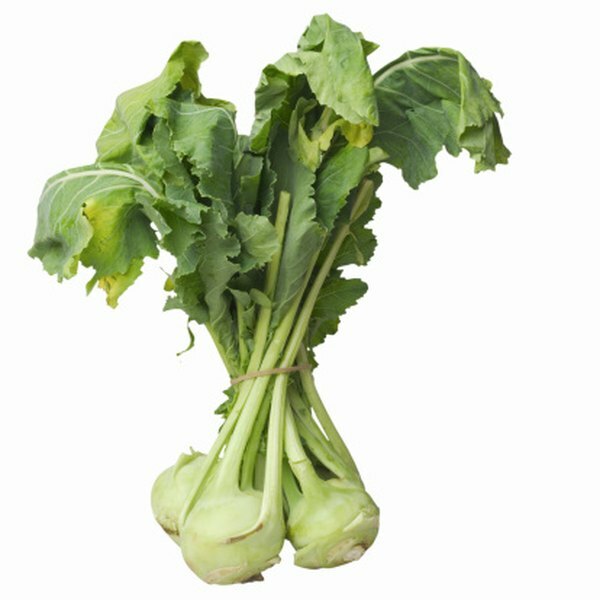 Kohlrabi adds a crunchy element to stir-fries, as the texture of kohlrabi is much like a water chestnut. To stir-fry kohlrabi, bring a small amount as olive, canola or peanut oil in a wok or skillet. Cut the kohlrabi into small pieces, then stir-fry until the kohlrabi is tender. If you like, add additional stir-fry vegetables such as carrots, onions or pea pods, along with seasonings and minced garlic. To cook kohlrabi in your microwave oven, place a small amount of water in a microwave-safe dish. Add chopped kohlrabi to the dish. Cover the dish, then microwave the kohlrabi on your microwave's highest power setting for five to seven minutes. Stir the kohlrabi, then cook for an additional five to seven minutes, until the kohlrabi is fork tender. Cook kohlrabi on a barbecue grill along with meat, fish, corn on the cob or baked potatoes. Cut the kohlrabi into slices or chunks. Place the kohlrabi in a bowl and add a few drops of vegetable oil. Stir until the kohlrabi is lightly coated with oil, then sprinkle the kohlrabi with salt and pepper or a seasoning blend. Wrap the kohlrabi securely with aluminum foil, then place the kohlrabi on the grill for 10 to 15 minutes.